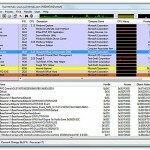 Process Explorer was originally created by a company named System Internals. That company was bought by Microsoft, and the Process Explorer tool is now offered directly from Microsoft. At first, Process Explorer appears to be just like Task Manager. In many ways, it is. The top pane in the screenshot above shows all running process and allows you to change their priority or kill the task (just like Task Manager). However, the bottom pane is what really sets Process Explorer apparent. It’s content changes, depending on your settings, and allows you to see what files a process is accessing, the memory location allocated to process, loaded DLLs, and much more. 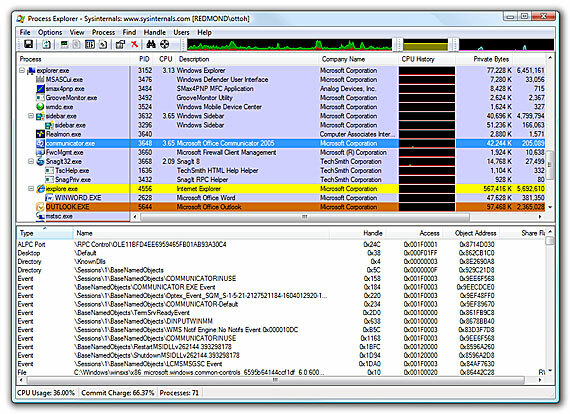 Process Explorer works on Windows 9x/Me, Windows NT 4.0, Windows 2000, Windows XP, Server 2003, and 64-bit versions of Windows for x64 and IA64 processors, and Windows Vista.